I got an interesting prospecting note recently. It came, as so many do, disguised as a LinkedIn invitation. Honestly, I do try to look at these things to see if there is some value, something I can learn from the invitation, or from the individual if we connect. With this one, perhaps the biggest learning is how not to do things. 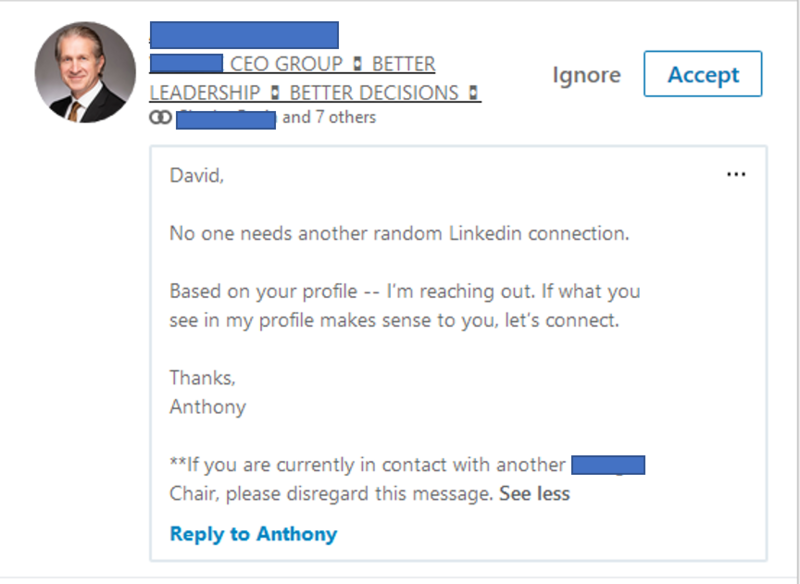 Anthony is right, no one needs another random LinkedIn connection. But apparently, Anthony is trying to do so. As I read the invitation, rather than making the connection about me (a possible prospect), or even our potential shared interests, he makes this whole thing about himself. (More in a moment). “Based on your profile….” But how does he say this? LinkedIn tells me who has looked at my profile, it even tells me some characteristics about anonymous people looking at my profile. The problem is, Anthony has never looked at my profile–or at least in the past 2 weeks. Apparently, Anthony did a search on the geographic area, and I suspect dozens of other people in my area with CEO titles got the same invitation. So we know Anthony has no interest in who I am, what I do, what I might be interested in. But why should he, after all, this is only about him! After all, he immediately directs me to his profile, asking me to do the work of figuring out whether I should be interested. He would have identified a shared interest and a reason we might want to have a conversation. But of course, since this is all about him, I have the task of figuring that out. And then he adds an interesting postscript. He’s only interested in connecting with me if I’m not doing business with anyone in his group/company. I guess, the only value of the connection to him is if he can sell me something. As an aside, this is an intriguing approach from someone like him. Presumably, in his capacity of advising CEOs on better leadership and better decisions, he leverages this kind of narcissism as best practice. At least Anthony is giving me the option of choosing whether I want to consider doing business with him–I opted out. Unfortunately, Anthony is not alone. Whether it’s LinkedIn or some other prospecting approach, too much of what we do is not about the customer, it is only about us. Our company—usually accompanied by the corporate glamor slides about how big we are, how many locations we have, and all the great customers we have. Our products—we talk endlessly about our products. We can recite speeds, feets, features, functions, benefits. We point people to websites or ask them to download white papers, inflicting the task of figuring out whether what we sell might be of value to them. And we make it about ourselves—what we want to talk about, what our objectives are. And it isn’t working, but we keep doing this at ever increasing volumes. Imagine how things might change if we made things about our customers/prospects. Imagine if we found what interested them, concerned them, or even might intrigue them. ““Based on your profile….” But how does he say this? LinkedIn tells me who has looked at my profile, it even tells me some characteristics about anonymous people looking at my profile. The number of people who aren’t playing with transparency in their deck should diminish — as long as people continue to call then out — as big liars. I agree 100%. 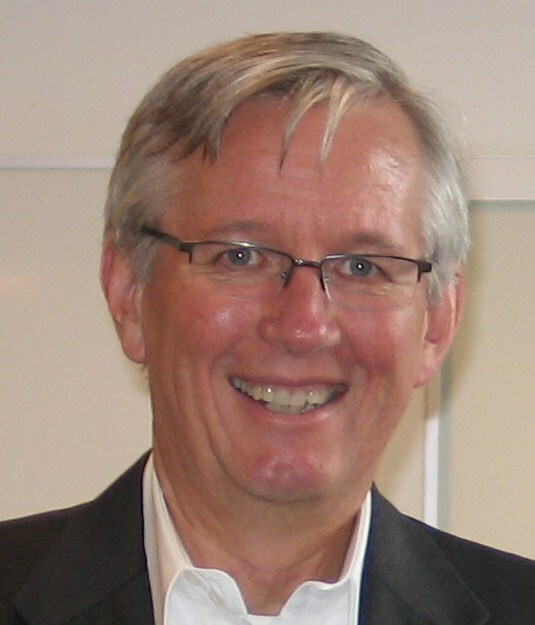 The problem is that buyers no longer pay attention to any seller outreach. 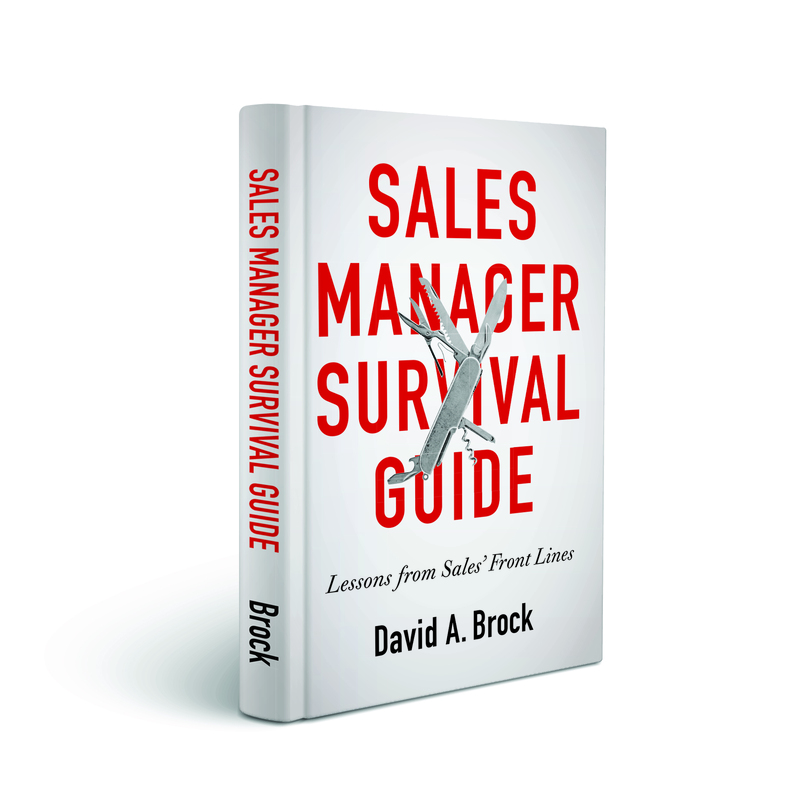 As sellers, we are inundating our buyers with a huge volume of messages, both good and bad. Because of this volume, good messages can’t rise above the noise created by all of the bad outreach. As customer focused sellers, our messages are lost in the sea of endless crap. 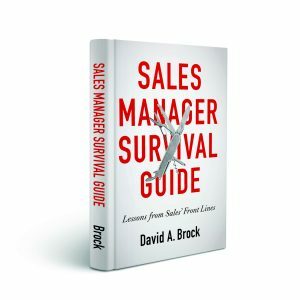 What is a good seller to do? Phil, it’s huge problem. Somehow good prospecting/outreach eventually comes through, but it becomes more difficult every day.